My job is a cat-courier. Each week I take a trapped cat over to my vet - first thing in the morning, picking it up about tea time. My first two customers were adult tom-cats, in beautiful condition, well fed, and moderately tame. At least my vet didn't have any problems handling them for their check-ups and operations! 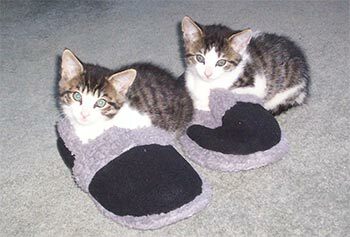 The third was a medium-sized boy kitten, fluffy and grey. 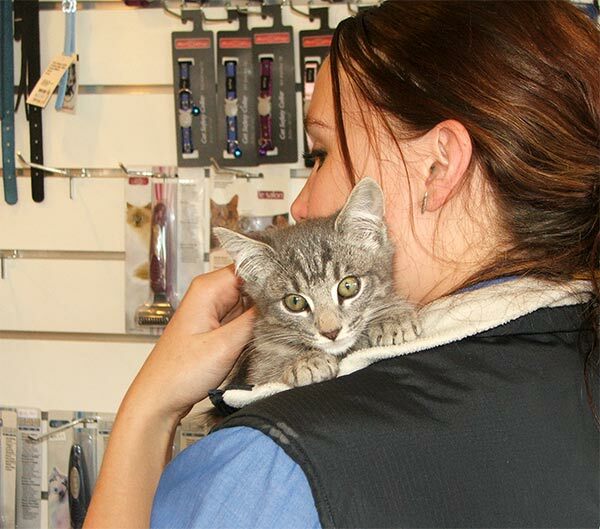 He was neutered and vaccinated, and stayed at the vet's so that prospective new owners could meet him. Then came the long Easter weekend, and he came home with me - he's my first foster-cat. Every day the grey kitten becomes more and more friendly, fitting in with our feline family. He smooches the dog.He purrs. He chases Stumpy's tail, lolls in front of Fluff-Fluff, and rubs noses with B-Puss. Mugsy the cat is thrilled - there are lots of little cat-meals for her to share, plus a cat-litter box - so much more comfortable! She's permanently camped out in the corner of the kitchen, like a favourite aunty. Is progress being made? 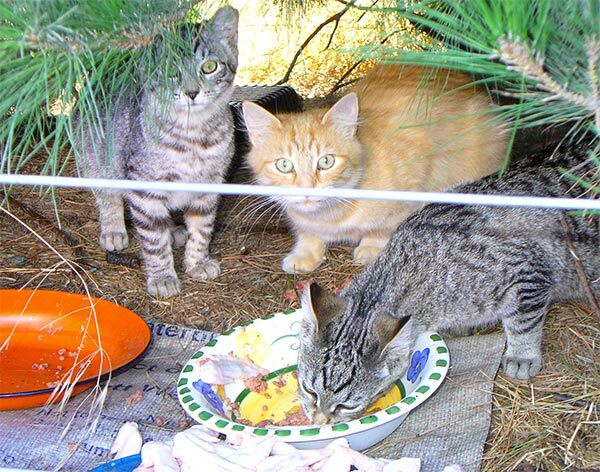 The Trap-Neuter-Return programme is considered a humane and sensible way to control feral cats. Permanent residents in Judith's cat colony are well fed and cared for. They are all responsive and confidently follow her around. Now many of the adults will make no further contributions to the cat-population! But each month new strays are drawn to the feeding stations. 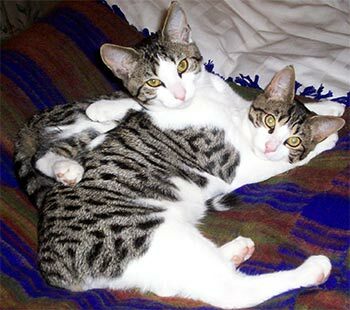 Many of these cats start off in homes as domestic pets. My cat-courier customer for today is a white female called 'Mother Puss' - she is almost certainly B-Puss's mother, though when I explained this to her she wasn't all that interested! Mother Puss will be returned later tonight, and hopefully her hidden kittens will soon be spotted and rescued. They will certainly be her last! So far 12 adult cats have been trapped, neutered and returned - each with a tiny clip out of the left ear. Eight kittens (three greys, one ginger, and four tabbies with white patches) have been rescued - two are being fostered, while the others are happy in good homes. Alas - there are more cats and kittens to trap, and winter is fast approaching! Next week there'll hopefully be another assignment for me. It's a small contribution, and a small success - but small is just fine! 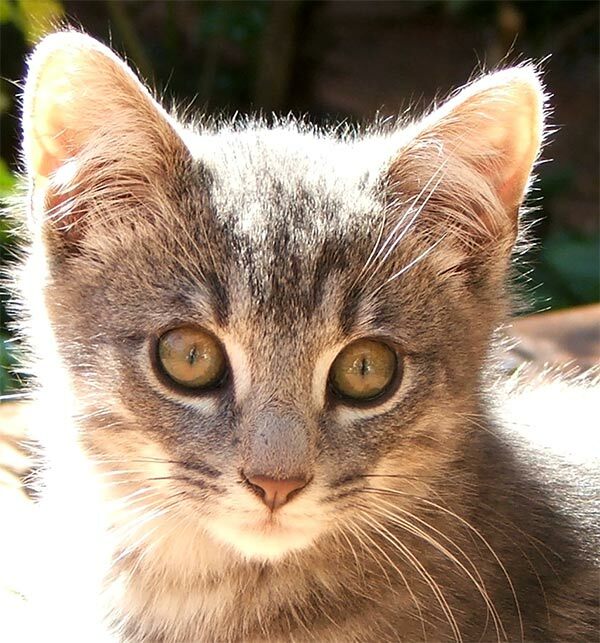 And grey kitten has just gone off to his new home with his lovely new owners. Dear little cat!